I used to live in a city, I didn't get to see so many native Australian animals there. When I moved with my family to the bush I was amazed by all the wildlife, and I still am! I'm sharing these pictures with you, so that no matter where in the world you are, you can get to know these little creatures too. A female wallaby with a joey in her pouch. ​Joey is the name for a baby wallaby. Here she is again eating a piece of wholemeal bread. Her little Joey was peaking out curiously from her pouch. I decided to call her 'Lady Wallaby' because she has lovely black eyelashes, and her fur is very neat. Here is a male wallaby. We call him Puss Puss. Puss Puss has visited us almost every day since we moved here. He gets up to all sorts of mischief. Anyway, in this photo he was sitting in the shade at the end of a very hot day. We get visits from other types of wallabies and also kangaroos. This is a photo of wallaby with her joey. She is not the same type of wallaby as Puss Puss and Lady Wallaby. She is very friendly and comes over to us when we make kissy noises. ​We haven't given her a name yet. What do you think would be a good name for her? Here is a nice little kangaroo I saw eating some grass in the back yard. The kangaroos at our place usually stay a fair distance from our house, unlike the wallabies. It's nice to watch the kangaroos hanging out together eating the grass. You can read about the difference between kangaroos and wallabies on the page "Kangaroo or Wallaby"
Possums are very good a climbing trees. The one in this photo really had beautiful dark brown eyes it was just the camera flash that made them look like they were glowing. Possums are beautiful little nocturnal animals. Sometimes they make loud growling and grunting noises at night. One of the possums that likes to climb around near our house makes a noise that sounds like a strange 'evil laugh'. It might be a scary noise to hear if you didn't know it was a cute little possum making it. 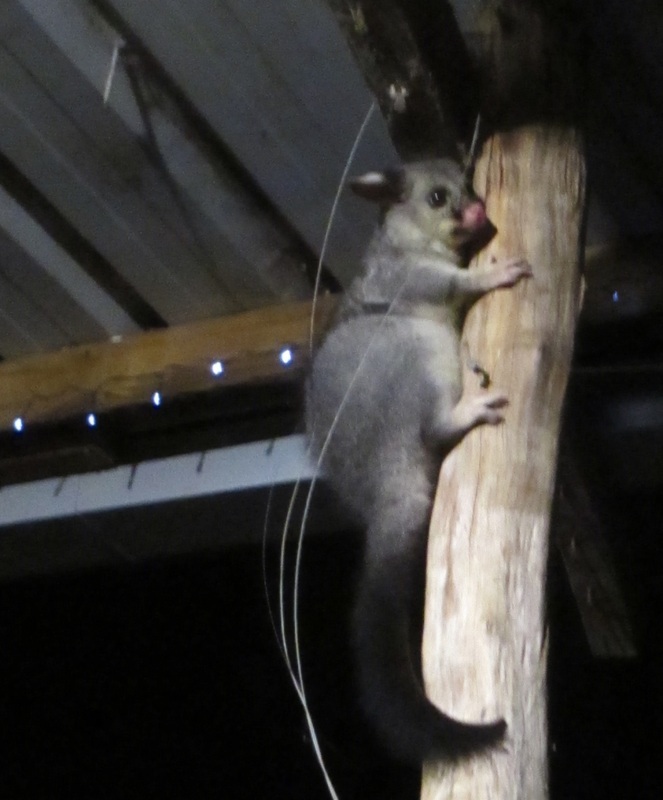 This possum was having a look at the little led solar lights under the veranda. Little goanna - he is a bit cheeky. It wasn't long after I took this shot, that he was prowling about on the steps. Maybe he was bored of digging in the leaves for insects and wanted to come inside for some morning tea? Goanna on a tree. 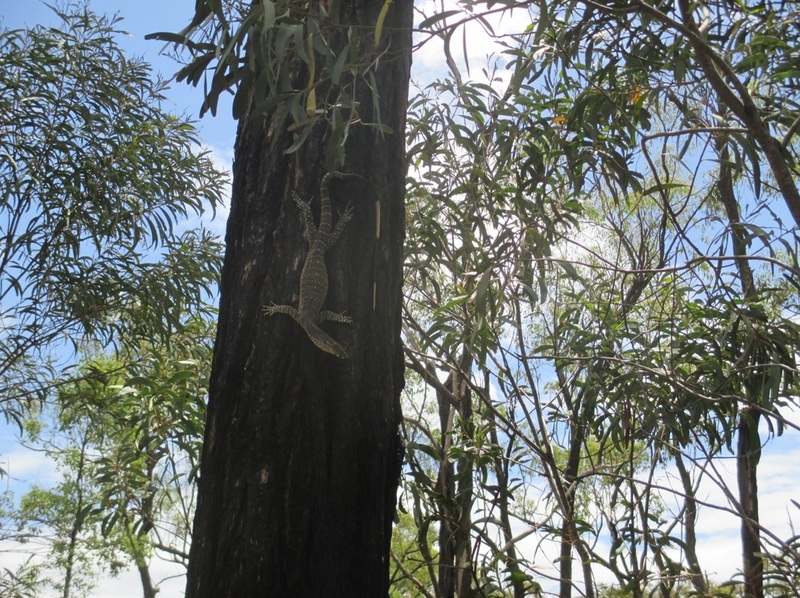 Goannas can climb very well! 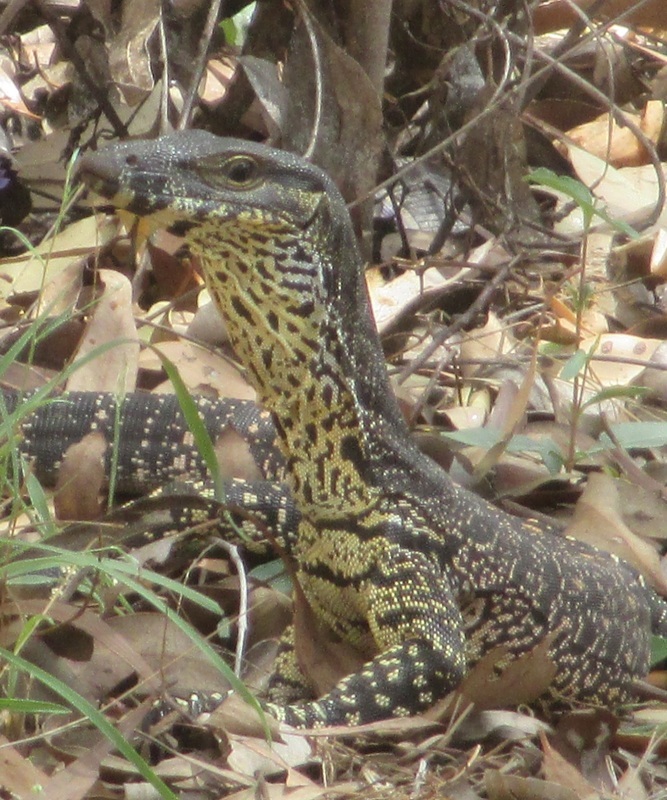 A little goanna - it was a bit over a one metre long (around three and a half feet). 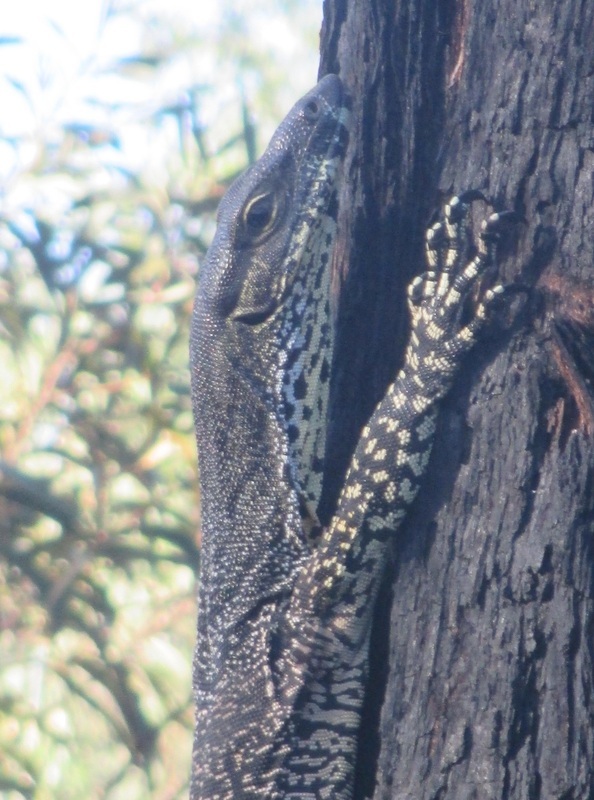 I took this photo from my window, of a goanna climbing down a tree. It is an Australian Iron bark tree; the bark is black because it was in a bush fire many years ago. Iron bark trees have special bark and sap that helps protect them from fire. The tree in this photo is very healthy despite of its burnt bark. 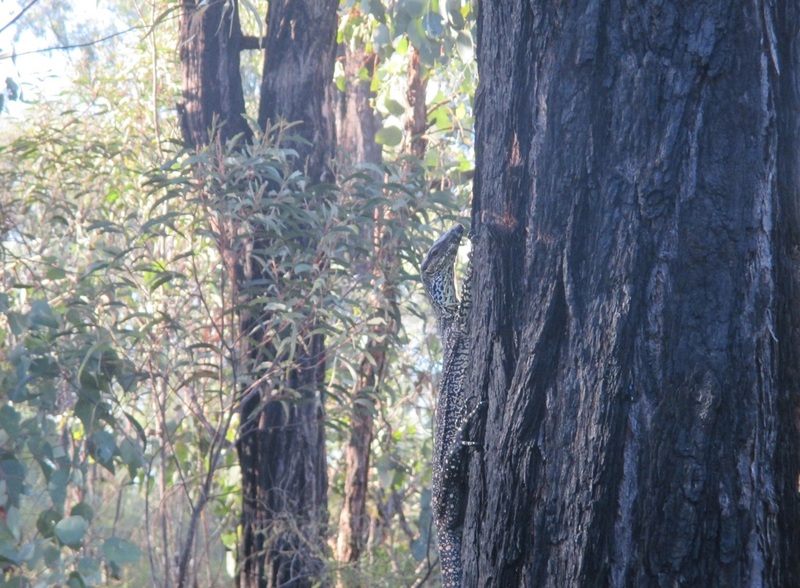 Goanna on a tree. Did you know goannas are also know as Lace Monitors? These are photos I took of green tree frogs. ​Green tree frogs are only one of the types of frogs I have seen here. I am not sure what type of frog this is, but it was a very tiny frog and an excellent climber too! We see many different types of insects, here are some moths, a beetle, a grasshopper and two photos of a cicada. I wonder what type of insects you see where you live. Insects can be very interesting to watch and learn about. 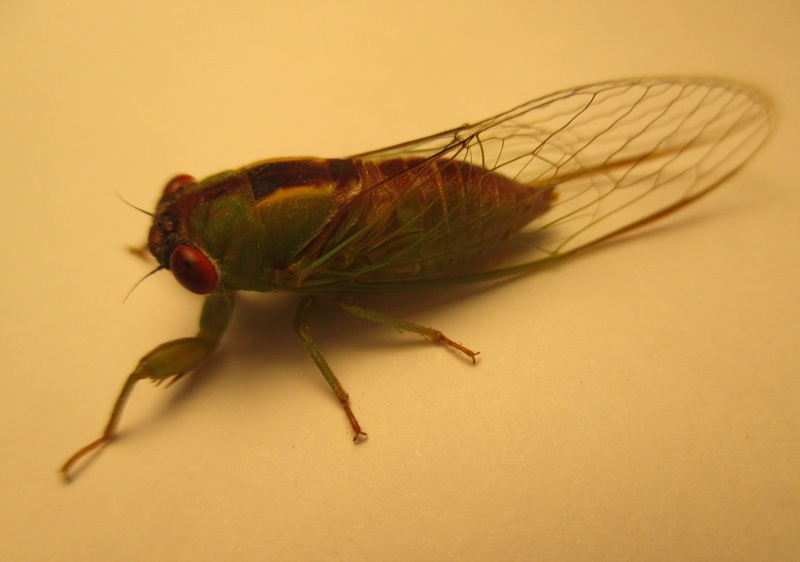 Did you know some people keep insects as pets? 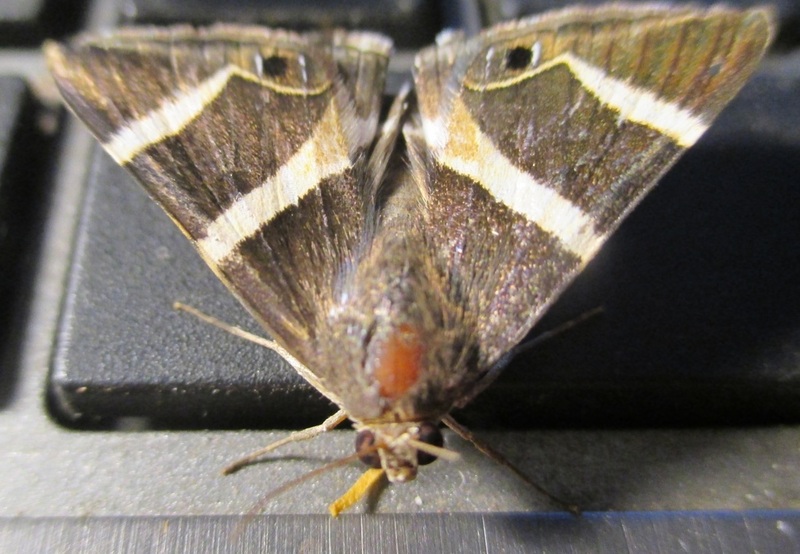 Do you have a favourite insect? This little cicada was walking about on my drawing. 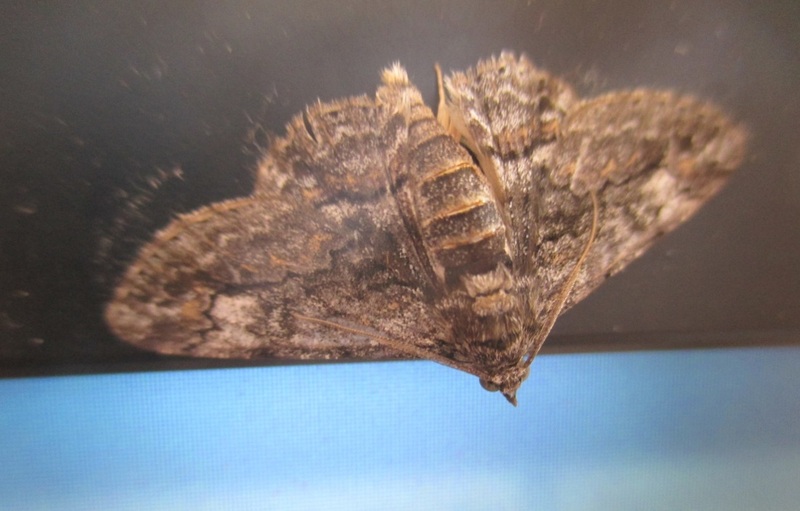 I suspect it really liked the light from my drawing lamp. I was very pleased that it stay to pose for some photos even though it was tricking to take a photo with a cicada on my thumb. We don't see echidnas every day. But they visit every now and then, and I enjoy watching them very much they have a wonderful walk. 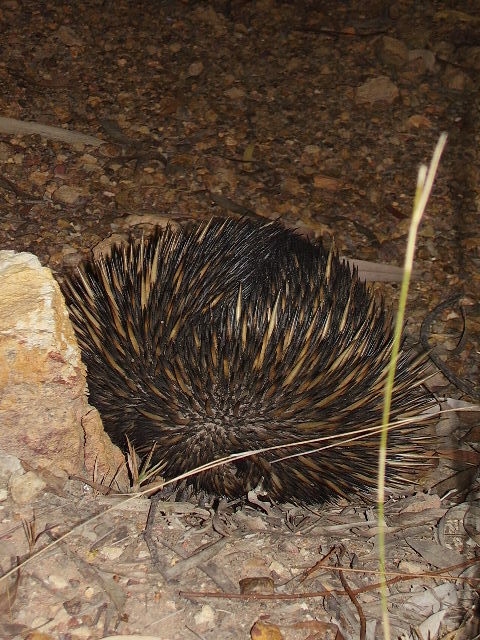 Echidnas are egg-laying mammals. There are our animals that visit us here too, I'll add more photos when I can.